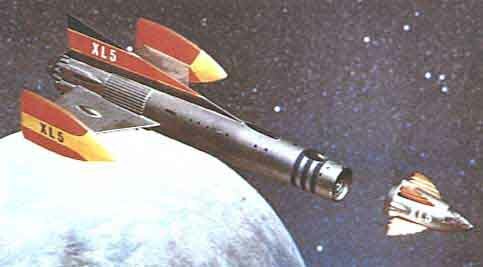 Fireball XL5, the sequel to Supercar marks the start of the truly great Anderson-produced puppet show. Its 39 episodes, made way back in 1961, may be black and white but the show's colourful style and presentation more than make up for the monochrome picture. And with the show slated for a DVD release there's never been a better time to cast our eyes back 40 years to the launch of a passed-over classic. The premise for Fireball XL5 is hardly rocket science - Steve Zodiac is the pilot of the eponymous rocket, a fantastic craft that takes our hero deep into space where he faces the mysteries and dangers of the unknown. His crew and able companions comprise of Venus - a space doctor - Robot the robot (voiced by Gerry Anderson himself) and the slightly dotty scientist Matt Matic. That's it - that's the premise. But when you sprinkle the episodes with humour, lace them with action and tie them up with Barry Gray's fantastic music the result transcends the show's rudimentaries, transforming it into something enduringly special. You want proof? Okay, how many other TV shows from 1961 warrant a remastered and restored release of their entire run? Fans of the show will attest to the staying power of Plant Man, Space Spy or the Subterraneanians. And even the slightly rickety launch sequence - with the smoke from XL5's rocket engine casting a show up the sky - can still quicken the pulse of even the most sated aficionado. In truth Fireball XL5 is not as well made as its immediate successor, Stingray, but its production values are still very high and speak of a time when children's TV was lavished with a level of care that is sadly lacking today.